Do you have a brand, company, project or product that you’d like to promote to a larger audience? Horror Headquarters is a constantly growing community full of active users & readers ranging in demographics from the every day average consumer to the very creators of those same films, games, books, art & other medias. 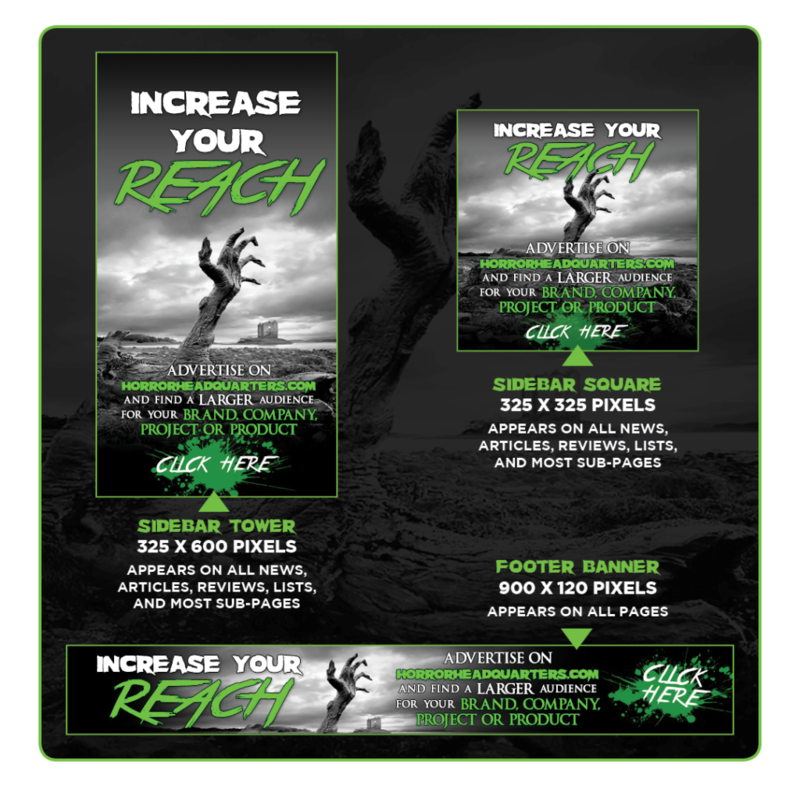 We’re actively reaching out, establishing relationships, and working with as many individuals and companies in the industry as possible to create a one-stop shop for all things horror while keeping a constant stream of interesting and relevant content flowing to bring both entertainment and traffic to the community. We can provide a platform to put YOUR brand in front of the eyes of our rapidly growing audience. CONTACT US today to discuss a strategy that best suits your needs for advertising, specifically tailored to your brand and our current traffic statistics for the site. We’re currently offering a variety of banner ad placements in various locations on the site. Ad campaigns can be tailored to whichever size or combination of sizes you prefer, using your custom ad artwork, and set up to click through to any link you’d like. See below for ad sizes & specifications. Template files are also available for download below in Photoshop format (.psd). Don’t have pre-existing art? Don’t have the means to create banner artwork yourself? Don’t fret! Our team can assist in creating a banner ad for you customized to your liking. CONTACT US today for more information or to set up a custom advertising campaign on HorrorHeadquarters.com!